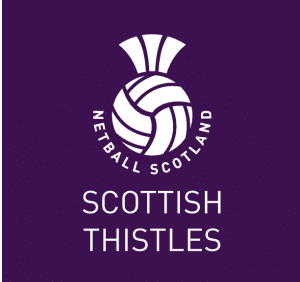 The Scottish Thistles are the senior representative netball team for Scotland. 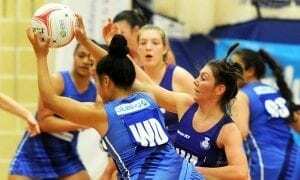 The team compete in a number of international competitions including Netball Europe Championships, the Commonwealth Games and the Netball World Cup subject to qualification. The Scottish Thistles are currently ranked 9th in the world, with 40 Internationally ranked countries. Click here for the latest World Ranking news. 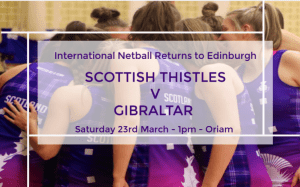 On Saturday the 23rd of March The Scottish Thistles took on Gibraltar at Oriam, Edinburgh in front of a sell-out crowd! The Thistles took control of the match early on with the score at Half Time 46-26 to The Thistles. However, Gibraltar fought back to close the points gap until the final whistle, Final Score after 60 minutes was Scotland 62 – Gibraltar 33. All 12 athletes took to the court over the course of the match, with Abbie Acheson, Savanna Antione, Cerys Cairns, Rachel Conway, Rebecca Edgar, Emma Love, Rebecca Metcalfe, Nina Mowatt and Beth Weir all receiving their 1st Thistles Cap. Congratulations to all 12 athletes; Abbie Acheson, Savannah Antoine, Cerys Cairns, Rachel Conway, Rebecca Edgar, Lynsey Gallagher, Emma Love, Sarah MacPhail, Rebecca Metcalfe, Nina Mowatt, Lauren Tait and Beth Weir on a convincing victory over Gibraltar. And a special mention to the Management Team; Lead Coach: Jill Anderson, Assistant Coach: Lesley MacDonald, Support Coach: Gillian Crozier, Team Manager: Karen McElveen and Physio: Bruce Mutch for all your hard work over that incredible weekend of netball! Your next chance to catch The Thistles in action will be during the Vitality Netball World Cup 2019! 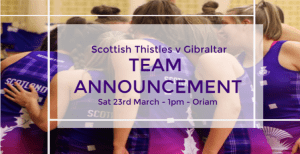 As part of our on-going preparation and selection process heading toward the Vitality Netball World Cup taking place in Liverpool in July 2019, we are delighted to announce the Scottish Thistles squad to face Gibraltar Netball in the International Test Match taking place in Oriam, Edinburgh on Saturday 23rd March 2019! We wish the squad good luck and look forward to seeing them take to court in the last international of the season before the World Cup. As preparations continue for the Scottish Thistles’ Netball World Cup 2019 campaign, we are excited to announce that International Netball will once again be returning to Edinburgh where the Scottish Thistles will take on Gibraltar. This match will be played at Oriam, Scotland’s Performance Centre, and we want YOU to be there #BackingPurple during an afternoon of quality netball. This is a chance to support the Thistles as they continue their journey on the #RoadToWorldCup and ramp up the persuit for their best ever Netball World Cup performance. Check out the full team announcement here. Having been part of The Scottish Thistles since 2010, we are sad to reveal that our middie Samantha Murphy is to retire from International netball. 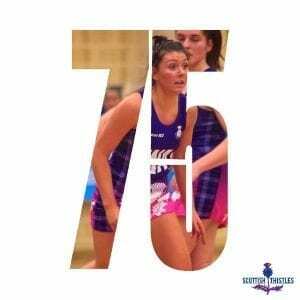 Travelling the globe to compete in events such as the Netball World Youth Cup in the Cook Islands (2009), to many Netball Europe Championships, Netball World Cup 2015 in Sydney and two stints as part of Team Scotland(Glasgow 2014 and Gold Coast 2018 Commonwealth Games) Sam has bagged an impressive 79 caps throughout her time representing her country, and we will miss her presence on the team. Sam, from all of us at Netball Scotland and of course the #ThistlesArmy, thank you for your commitment to netball over the years and we wish you the very best in the future. Today (12th April 2018) marked the end of the Scottish Thistles’ Gold Coast Commonwealth Games campaign, having played their final Team Scotland game of the tournament. Competing in Pool B against New Zealand, England, Malawi, Uganda and Wales, all but one team being ranked higher than the Thistles, was always going to be a challenge – but a challenge that our athletes have been preparing for, and were more than capable of competing for. And that they did (you can catch up on our matches by clicking the links held within the Results section below). Previous results against the likes of New Zealand and Malawi (14-71 and 35-62 at Glasgow 2014 respectively) were vastly approved upon, challenging New Zealand 29-60 earlier this week, and pushing World number 6 Malawi to a one-goal match the following day (being pipped to the post 50-51). The strength, fitness, match smarts and determination showcased by our athletes throughout this full campaign has been truly inspiration, and by all accounts eye-opening for those unfamiliar with the amount of work and training our team put into the sport. No more so than in today’s early morning (UK time) extra time thriller against Barbados. In a topsy-turvy match, Lynsey Gallagher continued to keep the Thistles within touching distance down the stretch and as time expired Lynsey scored to tie the game at 39-39, forcing overtime. Overall, Lynsey scored 35 of our 50 goals today, a real force to be reckoned with and a name hot on the lips of the BBC coverage commentating due of Sue Gaudion and Kathryn Harby-Williams. To be so close to teams who have for a long time dominated the world stage is encouraging, but not surprising to those involved behind the scenes, who already know just how talented our Scottish Thistles (and #FutureThistles) are and believe that a Top 8 spot (and higher) is very much in touching distance. Some of the tournament stats reported for our team are quite remarkable – like, Bethan Goodwin nailing 143 of the Thistles’ 254 goals, Lynsey G shooting with an average shooting percentage of 88, 10 outstanding (and game changing) intercepts for the fantastic Fiona Fowler, and 29 defensive pick ups from the one and only Hayley Mulheron. Further celebration came in the form of 75th International caps for both Lynsey Gallagher and Samantha Murphy. A fantastic milestone to reach in an International career. Both individuals have been integral members of the Scottish Thistles line up for many years, and at just 25 years old, we hope to see them add many more caps to their tally. The support we have received over the last few weeks has been truly remarkable and has had such influence on our athletes. To know that our members, followers and fans are behind the team and management, and feel inspired and encouraged by their performances is wonderful. Thank you. For the early mornings, the messages, the photographs – for it all. We always say that our #ThistlesArmy fans are the best, and once again you have shown this to us and the world. On social media alone, the Netball Scotland Facebook page has reached over 40,000 netball fans and gained 325 new followers – our Tweets have reached over 350,000 fans (the Malawi result reaching 34,000 alone)! I think we can say the profile of netball in Scotland is on the up, and a lot of that is with thanks to our team and these exciting performances. What’s next for this group? Well, once back in the country, the Vitality Netball Superleague kicks off again with 9 of the Team Scotland line up returning to their UWS Sirens team, Hayley returning to Team Northumbria, and Fiona kick starting her Adelaide Thunderbirds Suncorp Super Netball campaign. So, lots going on! Not too far in the future is the Netball World Cup 2019 which takes place next summer in Liverpool. So watch this space Thistles fans – lots of International netball coming your way. Thank you Team Scotland for your support and guidance throughout this competition, being part of the wider Team Scotland family in the only International multi-sport event to represent Scotland, has been another remarkable experience for our team, management and volunteers, and something we look forward to doing again come 2022. The Netball World Rankings have today (7th March 2018) been released and we are delighted to confirm that the Scottish Thistles have climbed one spot and now sit inside the Top 10 in 9th position. Just in time to kick start our International Women’s Day 2018 celebrations. This is the first INF World Rankings update of 2018 and sets a historic milestone in international netball, as for the first time in history forty (40) teams now have a INF World Ranking. This coincides with another milestone in that it is ten years since the Official World Rankings were launched by the INF, when there were just 22 teams with a ranking, testament to how international netball has grown over the years. We are so incredibly proud of the hardwork, commitment and dedication of the Scottish Thistles, Management Team, Support Team, of both present and past, who have all played their part in today’s announcement. We also thank our funding partners sportscotland for their continued support and belief. 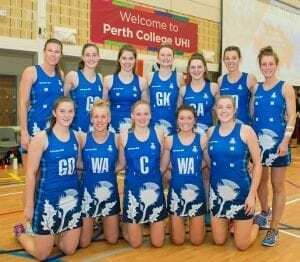 The Scottish Thistles now look ahead to next month’s Gold Coast Commonwealth Games as part of the #TeamScotland2018 family, and to competing at the Netball World Cup in Liverpool in the summer of 2019. This is most certainly not the end goal for the Scottish Thistles, and as a whole team will continue to press forward with their goal of being a Top 8 International side. 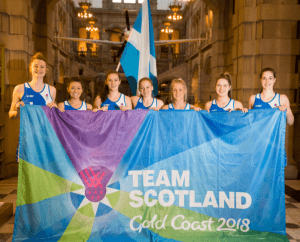 Team Scotland have today (Wednesday 14th February 2018) revealed the 12 athletes successfully selected to compete in netball at this year’s Gold Coast Commonwealth Games. To mark the occassion, Ella Gibbons, Sam Murphy, Emily Nicholl, Captain Claire Brownie, Nic McCleery, Niamh McCall and Jo Pettitt (pictured above left to right) joined some of their fellow #TeamScotland teammates for a media day hosted in the splendid surroundings of the Kelvingrove Art Gallery and Museum. An exciting squad of 12 players, with an even split of youth and experience. Six return from the Glasgow 2014 team, including Claire Brownie who will captain the team in Gold Coast, vice-captain Lynsey Gallagher and stalwart Hayley Mulheron, who has over 100 caps for the National side. Of the six athletes making their Games debut, three are age 20 or younger; Bethany Sutherland who captained the 2017 World Youth Cup team to eighth place in Botswana, Beth Goodwin, named Player of the Tournament on her senior debut at the Netball Europe Championships in 2016, and Niamh McCall, the first player born in the 2000’s to receive a senior cap. We are so incredibly proud of our 12 athletes, and our Management Team who have been working tirelessly over recent months and seasons to get to this point. We are of course #BackingPurple and supporting #TeamScotland2018 all the way and cannot wait to watch our team (from afar) during their time in Australia. Check out the official Gold Coast Commonwealth Games 2018 website for the full netball schedule. The Scottish Thistles were in International action last weekend (2nd and 3rd December 2017) securing two impressive wins over Samoa. Netball Scotland took this Test ‘on the road’ and brought top level netball to the city of Perth for the first time in over 30 years, something which we feel quite confident that the local crowds loved! Next up for the Scottish Thistles is the all-important Netball Europe World Cup Qualifiers taking place across Friday 19th to Sunday 21st January 2018. 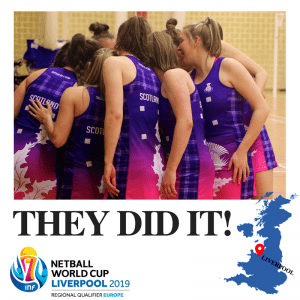 During this event, the Thistles will battle it out against Home Nation rivals Northern Ireland and Wales for a Top 2 position, confirming their place in the Netball World Cup 2019. Throughout this season, the following athletes will be coached by our Scottish Thistles Management team, with a view to being named in one of our upcoming Scottish Thistles events. 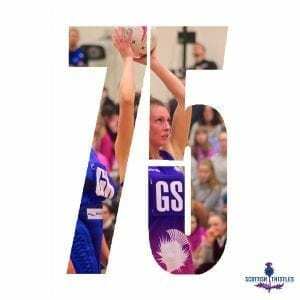 In the 2017/18 season, the Scottish Thistles will compete in the Netball Europe Championships (October 2017), a Test Series with Samoa (December 2017), the Netball World Cup Regional Qualifiers – Europe (January 2018), and also as part of Team Scotland in the Gold Coast Commonwealth Games (April 2018).